« Seiya Numata – Kanada’s successor? OP Cut 15: Yui’s guitar solo in the beginning of the opening and the part of Yui’s character introduction cut where she’s embarrassed and tries to flee from the camera are confirmed to be Yuuichi Itou‘s work, a relatively new face at KyoAni and somebody to keep an eye on. 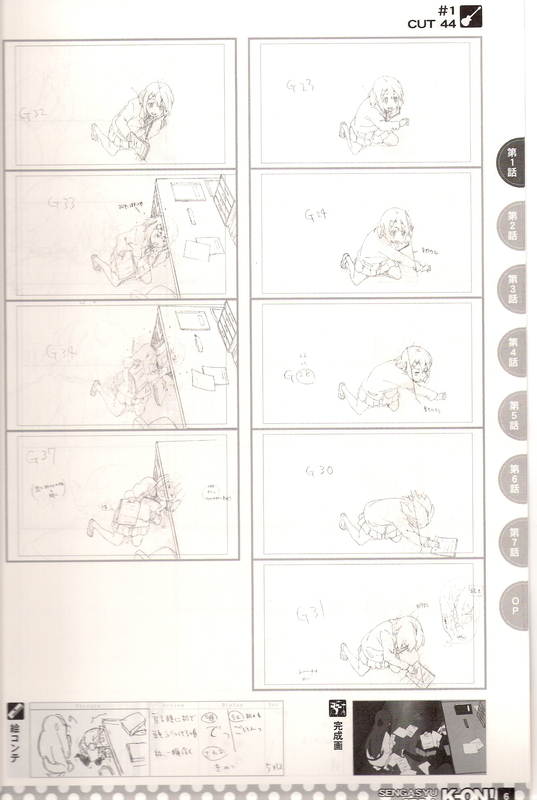 He drew all the key frames of above cut without any need for inbetweens. Characteristic for his style are the loose and chubby way he draws clothes and rendering everything quite flexibly, i.e. no stiff clothes or hair in the vein of, say, Mariko Takahashi. 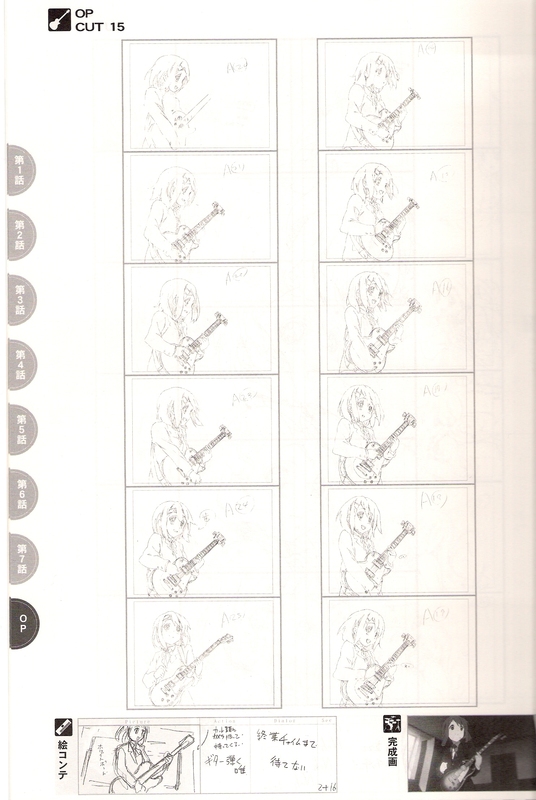 He also animated the music store part in the first half of ‘K-ON!’ #2 if you want to check out a more extensive scene by him. I hope we will eventually see Itou doing animation supervision work, but that depends on which career path he takes. Since KyoAni is pretty inflexible with these things, he’ll have to decide between directing or supervising animation. 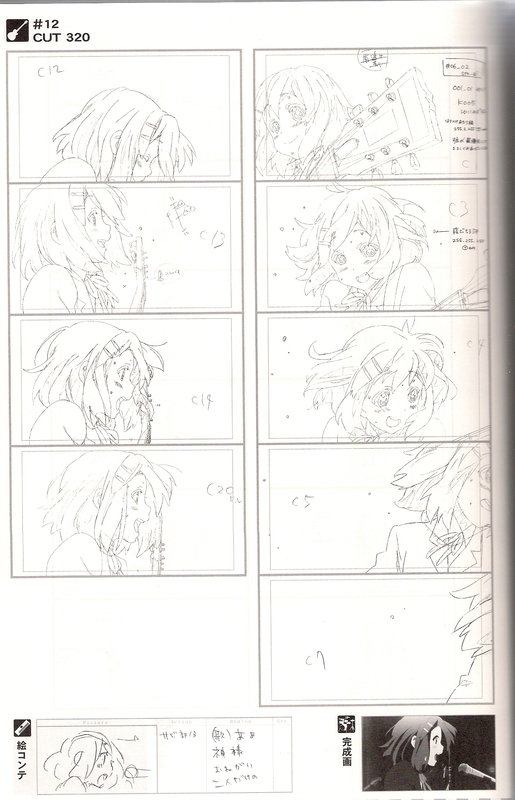 #1 Cut 44: Yui hitting her head. Granted, it’s hardly an impressive cut, but interesting from another point of view. On the audio commentary of ‘K-ON! !’ #2, Tatsuya Ishihara (director of ‘Haruhi’, ‘Clannad’, ‘Kanon’ and ‘Air’) said that this scene had been animated by the same person as the clubroom scene in ‘K-ON! !’ #2 (after the girls get the 500,000¥ for the guitar until Sawako-sensei finds out). Latter scene really moved a lot and the animation was incredibly fun to watch plus Ishihara added that the animator behind this scene was his favorite, so I’m curious who did it. The staff overlap between these two episodes isn’t too big with only three key animators being in both credits, namely Mariko Takahashi, Eisaku Kawanami and Hitoshi? Kashiwagi. Takahashi can be left aside as she has a different style and Ishihara would probably have called her by name if it was her, hence it comes down to Kawanami and Kashiwagi. All in all, I think it’s rather Kawanami as he’s been much longer at KyoAni and has worked on Shin-Ei Doga projects in the past which goes well with the vibes I get from that scene. However, I’m not entirely sure so don’t take my word for granted. #4 Cut 197: Moe﻿ moe kyun~! A very famous sequence, isn’t it. I’m pretty sure that Taichi Ishidate was in charge of this shot, who was also the director and storyboarder of that episode. Effects and linework leave little doubt. Ishidate is KyoAni‘s specialist for FX and action animation, which somewhat shines through here. He hasn’t many opportunities to show his talent with these things at KyoAni, but he sure takes every chance he gets – however small it might be – even if it’s just an exploding fan like in episode 11 of ‘K-ON!!’. #4 Cut 214: Not confirmed, but it’s probably Nao Naitou‘s work. 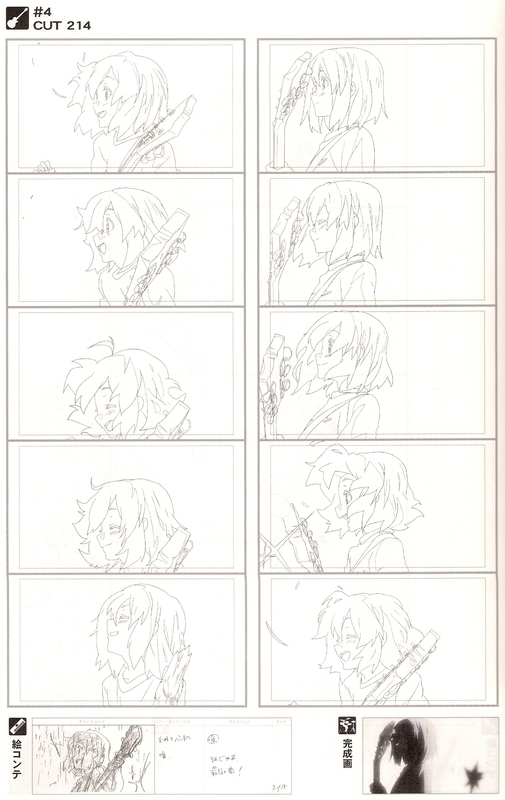 She’s easily one of the most talented animators at KyoAni, also proved by the fact that they often entrust her with the more complicated and/or important cuts. Naitou attracted attention with the nuanced expressions and acting in the final scene of episode 12 of ‘Clannad: After Story’ where Tomoya and Nagisa are jostling with each other. Their embrace in the climactic scene in episode 22 is also Naitou‘s work. She seems to prefer remaining animator for now as many others who entered KyoAni in the same year or even much later have already advanced to directing or animation supervision. #12 Cut 320: I guess some frames from Yoshiji Kigami shouldn’t be missing. Above scan shows some key frames from the concert scene in episode 12, which was of course a matter for KyoAni‘s ‘ace’ animator. The ‘U&I’ performance from ‘K-ON! 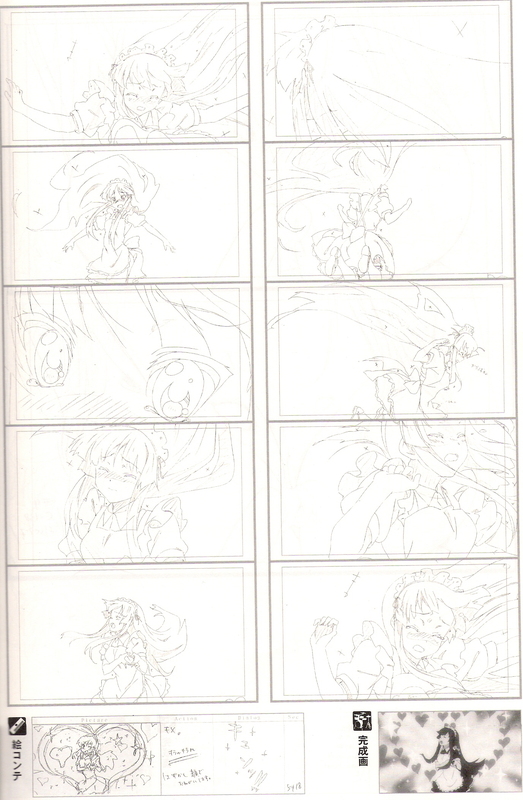 !’ #20 is also Kigami‘s work, for the more important episodes KyoAni still relies on his skills. If they really work on another season of ‘Full Metal Panic!’, probably even more so since he’s one of KyoAni‘s few really good action animators. He’s a real veteran, after all, with experience from many big feature film projects, most notably ‘Akira’ where he animated the action in the sewer tunnel. Sorry to ask but is it possible to have the titles of these books? Are they genga doujinshi on auctions or books you can buy on online shops? Oh wow, those books look great. I’ve actually been searching for those two for little bit now but, as you said, they’re sold out on the kyoani shop so they’re gonna be tough to find. Guess I’m just going to have to lurk Mandarake and Y!JA for awhile, haha. Anyway, I couldn’t agree more about Horiguchi’s designs. She really went above and beyond with her work on K-ON. The designs she made are ‘loose’ enough to keep the occasional superdeformity (necessary for a good number of the gags) from looking out of place but at the same time are ‘solid’ enough to allow for the more detailed and complex movements when needed. I can’t say I’m surprised that the names of the animators aren’t listed as most of the KA books I’ve seen don’t have them, but it’s still unfortunate. I guess as a sakuga fan part of the fun is figuring out who animated what for yourself but it would still be nice to have some confirmation. Especially when it comes to a studio like kyoani whose drawings are very consistent. 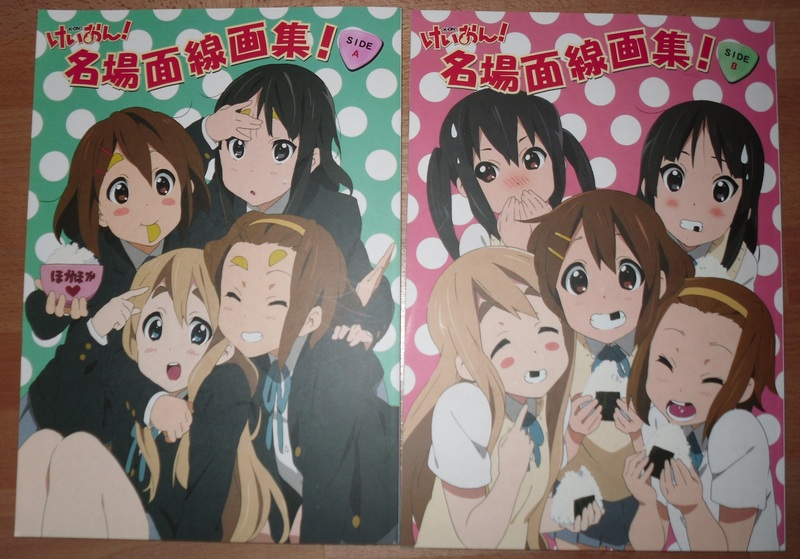 The storyboards of the two cuts from episode four also happened to be shown in the K-ON guidebook. Here’s my personal (read: horrible) scan if you haven’t seen it. I actually just noticed from looking at the storyboard and the KA that whoever did end up animating that ‘Moe Moe Kyun!’ shot gave Mio a decidedly more embarrassed and pained expression, haha. It’s more in character I guess. While I’m planning to pick these two up I’m really anticipating the season two KA collections that kyoani will likely come out with eventually. S2 has had some really nicely animated moments (even more so than S1) and it would be great to see those raw cuts. Anyway, thanks for the preview! Oh ya, and there’s something I was hoping you could give me some info on if you’re able to and if you don’t mind me using this space. I noticed in the credits of ep 22 of K-ON!! there was a gap in the genga credits and I found it unusual. As far as you know is there any significance to this? I ask only because I’ve rarely seen this done in credits for kyoani works. And I was also wondering if you could tell me what the significance of name placement in the credits is. Is the placement indicative of the amount of work done on the episode such as number of layouts and key frames done? I’ve always been a bit confused about that. Thanks in advance for anything you might be able to tell me. I’m also looking forward to the KA collections of season 2. I feel that the animation changed between the first and second season, maybe it’s the experience of working on a big feature film project. For instance, the layouts in season 1 are a bit more Shin-Ei Doga/Lucky Star-ish than the more cinematic compositions of season 2. Comparing them with these KA collections should be interesting. I think it goes without saying that if the rotation team in charge of #22 had an even number of people, there wouldn’t be a gap. And indeed, the position in the credits has to do with the amount of work done, but the details depend on the studio. As far as I know, KyoAni sorts the names by number of cuts in charge, hence the more cuts somebody animated, the higher up he/she is in the credits. However, KyoAni tends to divide work very evenly among the animators, so apart from the animation/episode director (who often help out with a few cuts) there’s usually not much difference in the volume of work. Good day, I’m a new visitor to your blog, and I’m really grateful that you’re one of the lesser audience who actually concentrates on the animation. As a student animator, I tend to think that people underrate this element, and people only concentrate on the story and enjoyment to rate a show, which is silly, because there’s so much more than that. I instantly subscribed, you’ve got a very interesting blog. Since I can’t read Japanese, I always miss out of the big names in animation, and you just helped me out a great deal. Dang. When I was in Japan, all they had was the lousy artbook of the manga. I wanted to look for something like this, since the Animation book of Kanon was great. And they only release it now? Thanks for dropping by. Actually, these two books aren’t really new, they have been relased about a year ago, that’s why it isn’t that easy anymore to get your hands on them. Oh, I want to get my hands on them. Love these kind of books.